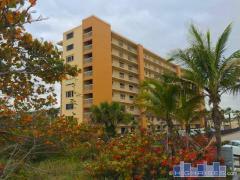 Buccaneer is a Satellite Beach condominium complex made up of two 8-story high-rise condo buildings. Buccaneer features an outdoor swimming pool, resident clubhouse, sauna, tennis courts and extra storage. Have any comments or questions about Buccaneer Condos? Ask your question and/or share your thoughts about this Building.